On August 29 1978, Hikashu made a stage debut at Raoya, a free jazz joint in Kichijoji. Having spent a month to rehearse, the quintet took on stage and played some originals including "20th Century" "Losing My Future" and "Weeping For The Earth" (an unreleased composition written by Mitama). They also played covers of Devo and Kraftwerk. Shortly after that, Raoya renovated itself as a restaurant of indian cuisine which offered live ethnic music, under the management of Wakabayashi Tadahiro (profile). Wakabayashi was a friend of the band, a member of the first Hikashu (later called Pre-Hikashu; I plan to write an entry about it) and actually he played a sitar on Hikashu's first album. He later became an authority and renowned educator in ethnic musical instruments. Raoya is sadly now defunct, closed circa 2000. Having encouraged by positive reactions, the band went on to make a demo tape, which was later released as "1978". According to the liner note of the 1978 album, Makigami still have the recording of the gig. Maybe someday it will see the light of day. We can only hope. On August 20, the reissue of "Watashi No Tanoshimi" ("My Pleasure") will be finally out. There is something unique about the release so here I will explain it. First of all, there is no identical package about the release. The reissue reproduced the stamped cover of the original. The stamps were affixed on cardboard jacket by hand work so there are no identical copies of each package. And there is two kind of the disc itself. One featured a picture of planet earth on its label and the other is the moon. And you cannot distinguish which one is inside, from the package. Even the matrix number is the same. So you have to open the seal to find out the picture of the disc inside. Initially, there would have been one kind of the disc, and it would have been one of the first double-sided picture cd, just as the original. The original vinyl release was a picture disc; side A featured a photo of planet earth, and side B was the moon. The former was called Earth Side and the latter Moon Side, and it is planned that the reissue is to reproduce it exactly. It seemed to be difficult to print anything on the readable surface of compact disc because it may interrupt picking up the laser signal. Actually, it is possible now, thanks to the advancement of technology. But quality-wise, there must be still some problems. Because apparently the band tried it but not satisfied with the result. So they decided to abolish the idea and take a different approach. Anyway, it is minor problem and the fact remains that this release is a must-have for fans; Two unreleased bonus-tracks are added, some tracks are restored in full form which originally edited down in the vinyl due to the physical limitation, and the sound itself is entirely remastered from the original 1/4 master tape with 5.6MHz DSD technology and significantly improved. And in the first place, picture vinyl has generally not the best sound quality. There are some interesting facts about the album. Fortunately, the reissue comes with the long interview of Makigami and Inoue as a liner note and it is very informative. Based on it, I plan to write an another entry about the album anytime soon. HMV Japan now accepts pre-order worldwide. See here for details. As reported here earlier, this year Hikashu has started a concert series entitled "Another World of Hikashu." It is a showcase event which aim is to introduce the member's solo activities to the Hikashu audience. The concert #4 is coming next Wednesday and it is a turn of Shimizu Kazuto. Shimizu started his career as a support member of Shingetsu, a progressive rock band, in late 1970s. Around the time he also participated in sessions of free jazz musicians like Takayanagi Masayuki. 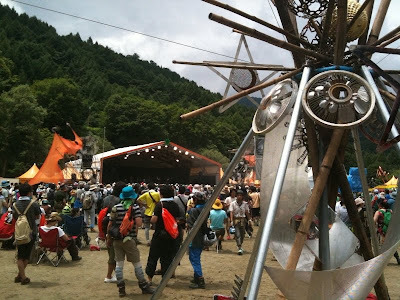 After then, he played with the bands like Chakra, Killing Time, OU, Shakushain, Semba Kiyohiko Group et al. Also, he has been active as a composer and session musician. In 1990, he released a solo album "yet somehow..." which is reissued last year and now available worldwide via HMV Japan (the product information page is here). Here are some of the groups he currently involved as a regular: Precambrian Clarinet Quartet, the Sleepwalkers and Shin-Okubo Gentlemen. He joined Hikashu in 2003. 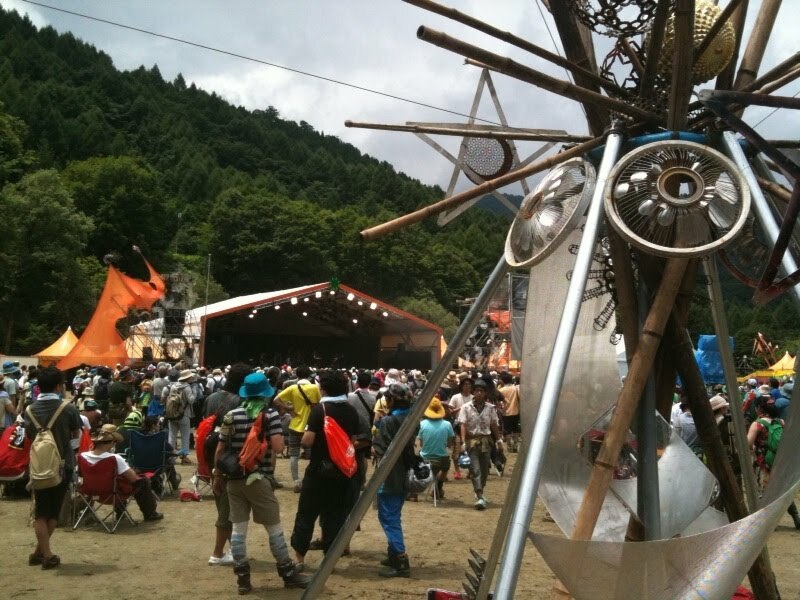 AREPOS is a group which Shimizu formed with vocalist Reichi in 1988. Its name is after a latin palindrome, SATOR AREPO TENET OPERA ROTAS (wikipedia). Anton Webern, the composer, had some peculiar obsession with the phrase and it is inscribed on his gravestone. (See here for details). The music of AREPOS is just beautiful music with beautiful singing, with twists of their own. Although Shimizu is a multi-instrumentalist and Reichi is also a transcendent drummer, as for AREPOS, they concentrate on piano and vocal, respectively. They have released four albums; AREPOS (1989), Kokodake No Hanashi (1995), Aoi Flask (1999) and other Colours (2005). Please note: Spiral Hall, which houses CAY, now closed until August 15, so if you make a call, wait until the day after tomorrow. Hikashu did an hour set at Orange Court on July 30. It was a dense, special and highly energized performance. They nailed down the audience quite literally. As of weather, there were some worries; the forecast told it would rain around the noon. Fortunately, occasionally got clouded, there was no raining during their stage. It was different from the beginning. As always, the band started by improvising. The difference was its length and style. Unlike thoughtful and lengthy improvisation of their regular opening, it was fairly short, about a minute and half, and its sound was so aggressive. At that moment, it was clear that the band had the intention to take an unusual approach and try to utilize the oppotunity to the fullest. While the rest of the band were careful and subdued playing, Sato Masaharu battered the sharp, thundering shots and Makigami Koichi hit a series of high note on his cornet. It sounded like a fanfare. After a swift decrescendo, Mita Freeman abruptly started cutting his guitar at high volume. It was the opening codes of "Alternative Sun". The band quickly reacted and the audience acclaimed. It was an appropriate choice; not only the song bears a strong driving feel but also it is the opening track of their 2nd album called "Natsu," which means, summer. The next tune was "Ikirukoto." As always, it worked as a vehicle of collective improvisation inbetween and the audience exposed to the intermissive performance of unrelenting imagination. In "Nyuunen," Mita, the other frontman of the group, was moving around in the west wing of the stage; he kicked, jumped and made a face to the audience while taking a guitar solo. The piano-bass-drums interplay in the interludes of "Digital Frankenstein" was acute and sharpening as ever. "Carp and Gaspaccio," the number I wanted to hear the most in the festival, was rightfully picked. An open-air stage under the hot sun of summer makes the perfect situation for the latin song in middle tempo. Mita did a series of aggressive actions again during a guitar solo. In latter part of the song, Shimizu Kazuto executed a comping with latinized syncopation, and upon it Makigami played the brisk notes with his cornet. It was so beautiful to listen to the mariachi sound in the mountain plateau. From the latest album, "Nikoseron" was chosen and it was considerably extended. The funk number has been featured a drum solo since last May, and this time it incorporated soli of drums, bass clarinet and bass guitar, in that order. 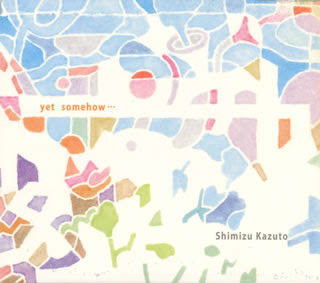 In the middle of the bass solo, Shimizu on bass clarinet and Makigami on cornet started to play a simple phrase in unison as obbligato, and while Shimizu was away from electric piano, Sato sang the main melody (and its variations) of the composition in falsetto while keeping the complicated rhythm. The transition was so smooth that it was beyond all recognition how much it was prepared or improvised from scratch. Then the biggest surprise of the day came. After "Nikoseron" was finished, the members gathered around the drum riser and discussed something for a while. Presumably a point of agreement was reached and Makigami announced "the next song we play called "Yokisenu Ketsugo" ("The Unexpected Unification")." It was a song from the "Uwasa No Junrui" ("The Human Being") album, released in 1981, and probably it was for the first time that the current formation of the band play that tune. Of course there was no marimba but, except for that, the arrangement they have played retained almost the same elements as the original. The band played it fast, Mita screamed and Sato took a drum solo; it was utterly impressive. The time had come for that signiture song. Sakaide Masami took a step forward, suddenly strummed his bass with heavily distorted sound for a minute, then stopped and asked "Do you know this thing?" And he backed to take a solo, this time it was the manic bass line of "Pike". After a chorus, the band ignited with the whole thing. The fast number was truly a killer, the ever crowd pleaser and this time was no exception. The last tune was "Puyo Puyo." Sakaide launched that persisting line and it filled the area. Makigami handed the microphone and roamed around while singing. Next to him, Mita continuously portrayed the lyrics; he played a sicken, a preacher and an amorphous creature, et al. Later Makigami laughed, cried and screamed while the band making a crescendo, and at its end, he fell down to the floor. Although it had to be a sort of digested form due to the time constraint, the band showed their essentials. They improvised, showed a sense of humor and tried to communicate with the audience. Makigami took a mouth harp solo and executed throat singing. At the quieter moments, Mita occasionally rubbed a pink plastic bag to the microphone and practiced a musique concrète of his own. The rhythm section was tight and flexible as usual. It was a success; Hikashu proved themselves again they could treat superbly with a bigger stage. Hopefully there will be a chance to see the band at the similar situation again in near future.